Please fill our application form. Second Main Subject - None -FluteClarinetSaxophoneOboeBassoonHornTrumpetTromboneTenor HornTubaPercussionConductingLearning the Art of Performing on stage If you choose a second main subject, the course fee will be equal to booking two individual courses. Number of Members For family applications please apply for each family member individually, for group applications please see the additional information at the group booking field. Group name If you are booking for a group please send a separate excel sheet with all details of each group member (eg. Name, address, instrument, course, accommodation, etc.) to peter.piano@aon.at. We forward all Accommodation inquiries to the Salzkammergut Touristik. They will get in touch with you with an individual offer. Special requests for accommodation please forward to Salzkammerguttouristik, Mrs. Angelika Putz, (blaeserurlaub@salzkammergut.co.at, www.salzkammergut.co.at, Tel: 06132 24000 54). I agree to the terms and conditions below. 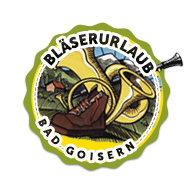 The organizer is not liable for loss, theft or damage to any instruments or any other valuables during the course or any other events of Bläserurlaub Bad Goisern. After receiving your registration we will invoice the course fee. The registration becomes valid after settling the invoice. We do not provide any supervision for under-age participants! The organizer is not liable for loss, theft or damage to any instruments or any other valuables during the course or any other events of Bläserurlaub Bad Goisern. We strongly recommend all participants to insure their instruments and valuables. Participants take part in the lessons and free-time activities organized by Bläserurlaub Bad Goisern at their own risk. The organizer is not responsible for any accidents or damage to the participant! We recommend participants have sufficient insurance. We do not provide any supervision for under-age participants! Together with their registration all under-age participants must provide consent by their parents/guardians regarding their participation and that they will abide to the course regulations. Participants agree to abide by house rules at the respective place of tuition (compulsory schools and music school)! (In particular this applies to the wearing of slippers as well as not consuming food and drinks whilst in the classrooms). If a course has to be cancelled then only the course fee shall be refunded. Organizer: Verein “Kulturkreis Inneres Salzkammergut”, Schmiedgasse 13b, 4822 Bad Goisern.